We've got Anteater Basketball coming on at 5PM, so tune in early for the next installment of Robert Benchley material! Artist                         Title                        Album                     Genre    New? Who made a pledge during last week's fund drive. It's looking like we must've come within spitting distance of our $10,000 goal, so if you haven't contributed yet, there's still time! Artist                        Title                          Album                    Genre    New? Some fund raising between two basketball games. Regular programming next week in theory! Artist                      Title                        Album                        Genre    New? Darkling Eclectica, Episode 1649: Fund Drive! Started Friday and will continue through till Monday, Nov. 16th. 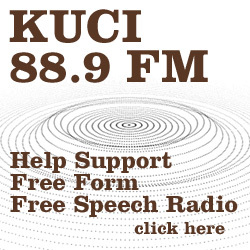 So even though there'll be another Sunday in there, KUCI'll be featuring basketball at 2PM and 5PM. So this'll be about the only Darkling Eclectica episode where we'll be asking you for your support. Head on over to the website at any point this upcoming week, though, and you'll find directions for giving us money. And thanks! Artist                        Title                        Album                      Genre    New?